144 pages : illustrations (chiefly color) ; 26 cm. Presents a collection of strange facts and coincidences about animals and human beings in the worlds of science, art, and entertainment. Ripley&apos;s believe it or not!. 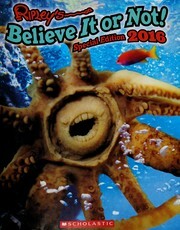 245 Title 00 $a Title Ripley&apos;s believe it or not!. 246 VaryingTitle 30 $a Title proper/short title Believe it or not! 250 Edition $a Edition statement Special edition 2016. 520 Summary $a Summary, etc. note Presents a collection of strange facts and coincidences about animals and human beings in the worlds of science, art, and entertainment.